Who says weddings take forever to plan? 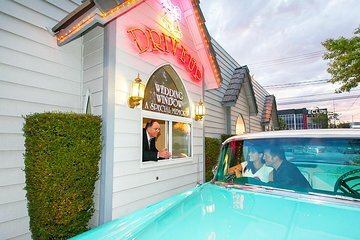 With this world-famous drive-up wedding in Las Vegas package you’ll get hitched in about the same amount of time it takes to order a cheeseburger! After stopping at the courthouse for a marriage license, you’ll make your way to the drive through window of this popular chapel where you’ll receive flowers and a dozen professional portraits of your big day. Opt fo the supersize package and enjoy round-trip limousine transportation, a novelty license plate and a professional DVD of the ceremony. One and two hour upgrades are available, which include either two or four stops on the strip for additional photos and fun. Please note, price does not include a $50 minister fee, $60 marriage license cost or the driver gratuity of $35 for the supersize package. The basic option does not include limousine transportation or stops along the strip. We had a fantastic experience, we got a early morning call from our limo driverArthur to let us know what time he would be calling for us at Excalibur. He arrived on time and escorted us to the courthouse for our licence. We arrived at the chapel and everyone was so helpful the experience at the drive in window was weird but wonderful. Thanks to everyone espically Arthur!! 2. The young lady at wedding window told us what we owed and automatically added 10 to minister 60 and 5 40 dollars to limo. I told her my my papers from Viator stated 50 and 35. Said they were wrong. We had to pay what she said. We had planned to tip them even more, but the way she approached the payment was tacky...no class. 3. I think we must have gone to the roughest part of town. Iron gates, triple locked doors, abandoned buildings, rough looking neighborhood. Chapel inside was nice..
4. Asked for English speaking service, GRANTED HE SPOKE ENGLISH, BUT VERY, VERY BROKEN ENGLISH. At one point during the ceremony my husband said, WHAT DID HE SAY. I had to translate. BOOK THROUGH EXPEDIA FOLKS. All other events we booked THRU EXPEDIA were TOP NOTCH. NEVER AGAIN thru Viator. Remember you get what you pay for. It was great! Getting married in a Limo beyond my dream wedding. Felt like a Princess. The 1 hr photo session was great. The gal did the pictures like pro. Quick and easy. Everything went smoothly. I booked a vow renewal as a surprise! for us to celebrate our 35th wedding anniversary. The drive-up wedding was great fun and I'd recommend it for a no-fuss, light-hearted way to celebrate a marriage. We enjoyed our wedding very much, all went smoothly without any stress. Great day loved it just what we wanted ! Wonderful service. Better then I expected. Absolutely loved my wedding. Everyone was very nice and the pictures came out great. For 185 we got limo, pictures, DVD and bouquet of roses. Highly recommended.